Another Year Winds Down................THANK YOU! I am blessed to be able to follow my passion and have it so well received by such enthusiastic doll collectors around the world. I just wanted to take a moment to thank all of my faithful doll customers and followers. I wish everyone all the best for the Holiday Season and most certainly a terrific upcoming New Year. Let 2016 be amazing and happy and healthy to all. Photo courtesy of one of my happy customers and friend who knows the true meaning of "playing with dolls" .....Thank you! I have made a few of these Doll Size Georgian Pinballs! They are so sweet. These are age appropriate for the Queen Anne Wooden Dolls that you see in my site or that you might own. These are about 3/4" in diameter or less. I am so thrilled to share with you, Camilla Higgs. She is just over 16" tall and fully jointed. She is hand carved by me from wood that grows here on our 200 acres. 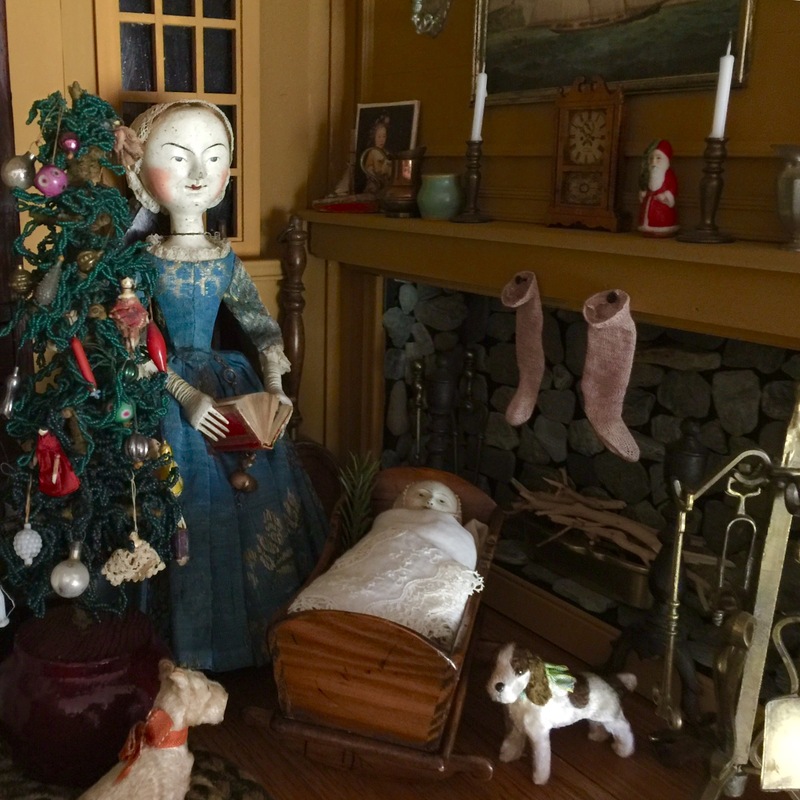 She is made from Basswood and is jointed and the hips and knees and has had carved wooden hands and lower arms and Linen upper arms just as the old dolls of her type did. She is wearing kid leather fingerless mittens. Her petticoat is simple but made from really early cotton with wonderful patina. Camilla's gown is very special and made from early 1700's silk that is a wonderful shade of blue and has a tiny bit of pink, yellow and some great tarnished silver threads to the pattern as well...............to die for! Her slippers are silk of course. Her cap is made from some amazing early lace that I bought from the UK a long while back. Her head swivels so she can be posed. She has attitude! Oh, I almost forgot to mention her Chatelaine with the hand made antique silk pinball that I specially made for her! I hope you have enjoyed seeing all these photos of Camille Higgs.